Do alemão: a "saudade inconsolável" vinda do coração por "não sabemos o quê"
ESSE GRUPO É PARA AS PESSOAS QUE ADORO NO HABBO, PARA AS PESSOAS ESPECIAIS, E QUE ADMIRO MUITO!!! O Quarto de Inscritos do FabzPixelado, venha se juntar a familia. Vídeos lixos no canal ytleonardop. Asas tão fortes quanto indestrutíveis! Procure por Aviador-Silva e aliste-se! Grupo destinado aos Praças da Força Aérea Brasileira. Procure por Aviador-Silva e aliste! SERÁ QUE É SÓ MAIS UMA GUERRA FRIA? OU TERÁ SANGUE.. PARA JOGAR É SÓ ENTRAR NO GRUPO.. 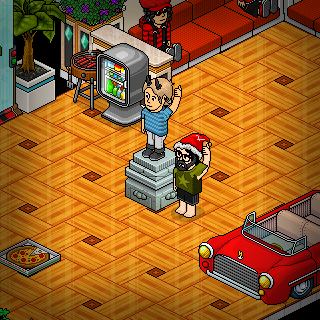 SE INSCREVAM NO CANAL: iLobs Habbo e Quack rs para ganhar 2 mobis. OBS: comentem seu nick no último vídeo dos canais. Taken in this room on 9 February 2018 and received 4 likes. Taken in this room on 6 February 2018 and received 2 likes. Taken in this room on 6 February 2018 and received 3 likes. Taken in this room on 6 February 2018 and received 0 likes. Taken in this room on 5 February 2018 and received 0 likes. Taken in this room on 21 June 2016 and received 2 likes. Taken in this room on 19 June 2016 and received 2 likes. Taken in this room on 17 June 2016 and received 3 likes. Taken in this room on 14 June 2016 and received 1 likes.